You need a special kind of floor to handle high traffic areas. Not only do they need to look good and be easy to clean, your flooring must be designed for maximum durability. Here is a brief look at a few of your best options. Vinyl is stylish, durable and affordable. It can handle both heat and humidity and it even provides a little extra support for your body compared with most other durable flooring materials. Whether your high traffic area is a kitchen, dining room or hallway, vinyl is a fantastic option. Tiled floors are a wonderful choice for any high traffic area. Not only are they extremely durable, they are also available in a wide variety of styles and colors to complement your existing interior design. The cool touch of tiles will also provide welcome relief throughout those high traffic areas on hot summer days. The flooring in those high traffic areas will have a significant impact on the overall look of the space and nothing will boost the level of class and style quite like hardwood floors. Hardwood is strong enough to handle traffic of any kind and its gorgeous natural looks are second to none. Damage to a hardwood floor can also be repaired relatively easily and, if cared for properly, hardwood flooring can literally last for decades. If you’d like those high traffic areas to be durable, stylish and comfortable, carpet provides a wonderful solution. Short pile carpet will be more practical in busy areas than thick pile varieties and carpet tiles are well worth considering too, as you can replace individual sections if necessary without having to redo the entire floor. Carpet is also a fantastic sound absorber, particularly those made from wool, which will help to keep noise down considerably. High traffic areas need flooring that can handle extensive punishment and the hard surface of laminate is more than capable. Laminate is available in a wide range of styles and colors; it is extremely durable, and yet, it provides a rather forgiving surface in case of falls. 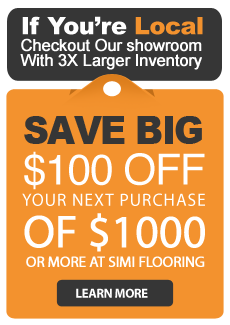 Those looking for flooring that offers great value for money won’t find many better options than laminate. Not all floors were made equal and so you need to choose your flooring carefully, especially when it comes to your high traffic areas. Research your options carefully and seek professional advice before making your decision.